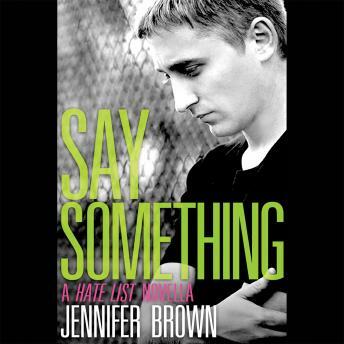 In Hate List, Jennifer Brown delivered a powerful story about grief, friendship, and forgiveness in the aftermath of a school shooting. Now, she explores an evocative new narrative while digging deeper into the themes first touched upon in her debut novel. David Judy knows what it's like to be bullied. Shy and gentle, with a soft voice and "a girl's name for a last name," he is a prime target. Thankfully, there's one girl David feels at ease with -- Valerie, the girl who's been dating his neighbor and sometimes-friend, Nick. Valerie is kind to David and pulls him into their circle of outcast friends, where he finally feels like he (sort of) belongs. So when David starts to suspect that Nick and his friend Jeremy are planning a revenge plot against their tormentors, he wrestles with whether or not to tell someone. By the time he finally works up the courage to say something...it's too late. David tries to put what he knows behind him -- to forget and move on -- but that's hard to do as senior year starts and he watches his old friend, Valerie, struggle in a deep, dark place of guilt and confusion. It's time to speak up. David may not be able to end bullying, but by standing up, he might just make a difference. And that's what matters.